At GrowthForce, we specialize in helping nonprofit organizations keep their finger on the financial pulse, so they can focus on what really matters – serving the mission and achieving their greatest potential. Are Your Financial Operations Holding You Back? Is it easy to produce Board Reports each month? Do you have confidence in the accuracy of your reports? Does each program manager know their budget and how much is left? Can you quickly tell donors how last year's grant was used? Are your audit and IRS Form 990 tax return processes pain-free for you and your staff? Do you have insight into how much money remains in each restricted fund? Do you have internal controls in place to prevent fraud and theft? While serving as Chief Financial Officer, and then Chief Development Officer, for Amnesty International USA, these were the questions that GrowthForce Founder Stephen King was asking himself. And this is why GrowthForce remains passionate about nonprofits - to provide them with the same resources and financial tools that typically only Fortune 500 companies can achieve. From partial to full outsourcing options, GrowthForce offers customizable services to help your organization gain control of cash flow and manage reporting requirements. We do that by reducing manual efforts and improving operational efficiencies. Our Team, Technology & Processes approach means our nonprofit clients get timely, accurate financial intelligence, without blowing the budget on salary, training, software, hardware, and office space that come with hiring more in-house staff. 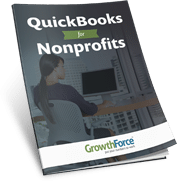 A helpful how-to whitepaper for properly setting up QuickBooks to meet the specific nonprofit accounting and reporting needs.